What’s not to love about lemon and basil together? 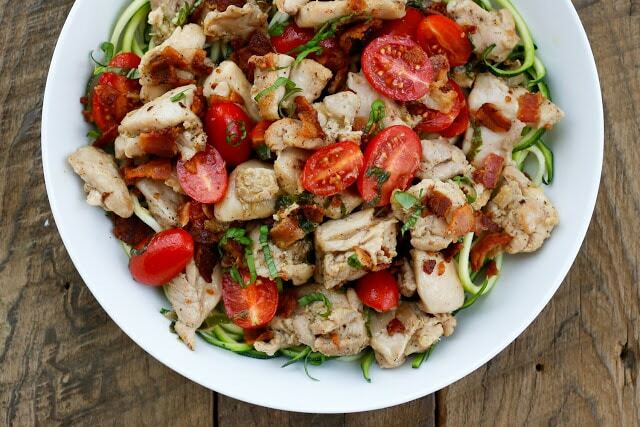 Add a bit of bacon, tender chicken, and plenty of juicy tomatoes and I am going to be all over that dish. When I first saw this sauce in my friend Shawn’s cookbook, I couldn’t get it out of my head. As she wrote the original recipe, the chicken in this recipe is replaced with scallops, which I imagine tastes fantastic too. However, I already had chicken on hand, so I went with the option I already had in the house. 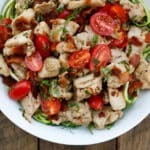 This Chicken with Lemon Basil Sauce is amazingly flavorful, with a sprinkling of bacon, plenty of lemon and a surprising richness in the simple sauce. I served the chicken with the sauce over crisp spiralized zucchini and the lemony sauce was absolutely perfect with the vegetables. If rice or pasta is more your style, the chicken is great served that way as well. 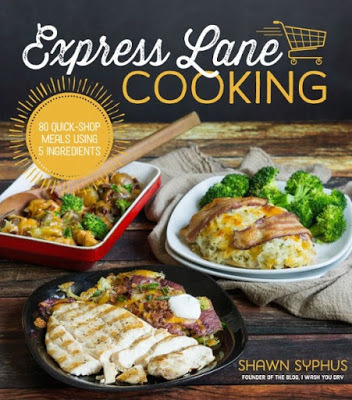 Speaking of Shawn’s cookbook, I am giving away a copy of Express Lane Cooking today! Filled with gorgeous photos and 80 dinner recipes, this cookbook is designed to get you in and out of the grocery store in record time and help you get a stress-free meal on the table each night. Scroll to the bottom of this post for your chance to win a copy!While I am not a big fan of vegetable noodles as a substitute for pasta noodles, I most definitely am a fan of vegetables. There are some dishes where the vegetables truly shine in their own awesome way and this is definitely one of those dishes! Don’t expect your vegetables to suddenly taste like a plate of pasta. You’re still eating vegetables after all. Spiralizing isn’t about magically transforming your vegetables into pasta, but it does make the most of the vegetables that you already love. I made this recipe for lunch a couple days ago, and despite my plans to save a few portions for lunch the following day, Sean and I managed to polish off almost the entire recipe in one meal! 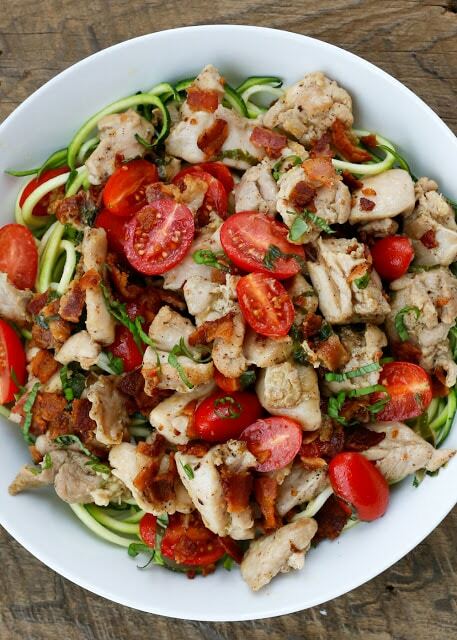 Just to clarify though, if you choose to make this with 8 ounces of pasta, instead of the spiralized zucchini, it will be far more filling and I imagine that you could easily feed a family of 4-5 with that amount of food. However, I was in the mood for extra vegetables and I do so love my spiralized zucchini. Heat a large stainless skillet over medium heat and cook the bacon. While the bacon is cooking, sprinkle the cornstarch, salt, and pepper over the cut up chicken. Remove the cooked bacon from the pan with a slotted spatula and drain on a paper towel lined plate. Drain the grease from the pan, leaving 2 tablespoons in the pan. Place the hot pan back over medium heat and spread the chicken across the pan. Let it cook without stirring for 2 minutes. Turn the chicken pieces over and cook an additional 2-3 minutes, just until cooked through. Remove the chicken to a plate or bowl. Add the chicken broth, lemon juice, and lemon zest to the skillet and bring to a simmer. Cook for 3 minutes. Stirring occasionally and scraping the browned bits off the bottom of the skillet as it cooks. When the sauce has thickened slightly, add the butter and basil. Taste and add more salt and pepper, only if needed. Add the chicken and tomatoes to the sauce. Serve the zucchini noodles, pasta, or rice topped with the chicken and sauce. Sprinkle each serving with the cooked and crumbled bacon. Enjoy! A splatter screen is very helpful when cooking the bacon for this recipe. Also, I'm a big fan of this spiralizer or this julienee tool for slicing the zucchini into perfectly "twirlable" noodles. All you need to do to be entered to win a copy of Express Lane Cooking is leave a comment on this post telling me what you had for dinner last night! Make sure there is an email address included so that I can contact the winner. Entry is limited to US residents only. I wish I could include everyone, but the legalities involved with international giveaways prevent me from doing that. Giveaway ends Sunday, August 16th, 2015 at 11:59pm EST. Good Luck! We just had hot dogs, since hubby had to work very late. Your honey Siiracha chicken! Love it! This looks delicious, I would love some right now. Last night we had sauteed mushrooms and some leftover rice, which I fried with spring onions, corn and peppers. Had a garden vegetable salad with beets, green beans, carrots, tomatoes, basil and green onions all from my garden! The only thing I purchased was lettuce. It was yummy with balsamic vinaigrette. I'll be honest and tell you Cheerios and milk. But the night before was Chicken Kofta with a cucumber/mint/yogurt sauce on Naan. Congratulations to Shawn and thanks for hosting a generous giveaway! Last night I had a peanut butter and jam sandwich. I just could not get motivated to make anything else! I like to cook when I am in the mood but last night was one of those moody nights! Hoping to receive a great cookbook to motivate me!